Authors: Lovetskiy K.P., Nikolaev N.E., Sevastianov A.L. transmittance, reflectance, refractive indices determination, thin films. 1. Introduction Methods for the theoretical design of optical coatings, based on modeling the interaction of light with thin-film structures, provide, among other things, reliable production monitoring of thin-film multilayer structures with specified properties . We describe some approaches to the solution of the main problems related to simulation of the optics of multilayer stacks and optical characterization of the used materials. The base mathematical models applied for the description of the light wave propagation through a homogeneous optical medium and for the determination of the optical characteristics of thin and thick layers of optical materials based on the results of light intensity measurements are described. The main mathematical formalism employed in the software is based on solving the Maxwell’s equations for propagation of light through anisotropic stratified media. The algorithm uses the Berreman approach and his matrices formalism. We will consider solutions of the two principal problems in optics. The first problem consists in determining the properties of various optical systems for the given optical parameters of components. The second problem, inverse to the first one, is to determine the optical parameters - refractive indices and absorption coefficients - from the measured intensities of transmitted and reflected polarized light waves. Practical mathematical models techniques for determining the optical parameters of thin films are outlined. § Direct problem consists in simulation of the optical properties of various multilayer systems for preset characteristics of the whole stacks for a given configuration of the light wave field. § Inverse problem means evaluation of refractive indices of transparent homogeneous layers (and their thicknesses) incorporated into multilayer stack using the results of optical measurements. The solutions of both problems have to be found in a certain spectral range, that is, over a certain interval of wavelengths. The main elements of mathematical models used for the formulation and solution of these problems are the wave theory of light, Maxwell’s equations, and the properties of the permittivity tensor of a material. Solution of the inverse problem is based on the main property of dielectric constant: its real and imaginary parts are connected to each other by the Kramers-Kronig relation. Let us discuss some available approaches of mathematical modeling of light interaction with isotropic or anisotropic layered materials. 2. Muller Calculus Mueller calculus is a matrix method for manipulating Stokes vectors, which represent the polarization of incoherent light. It was developed in 1943 by Hans Mueller, then a professor of physics at the Massachusetts Institute of Technology. Light which is unpolarized or partially polarized must be treated using Mueller calculus, while fully polarized light can be treated with either Mueller calculus or the simpler Jones calculus. Coherent light generally must be treated with Jones calculus because the latter works with amplitude rather than intensity of light. The effect of a particular optical element is represented by a Mueller matrix; which is a 4 × 4 matrix and a generalization of the Jones matrix. Any fully polarized, partially polarized, or unpolarized state of light can be represented by a Stokes vector (�). Any optical element can be represented by a Mueller matrix (�). If a beam of light is initially in the state �� and then passes through an optical element � and comes out in a state �0, then it is written �0 = ���. The Muller matrix is used for analytical description of the action of optical elements on polarized light beams. This square matrix (linear operator) with real coefficients describes a change in the Stokes vector upon the passage through a given optical element. In contrast to the method employing the Jones matrix, which is applicable only to description of the light transmission via nondepolarizing optical elements, the Muller method can be used to describe the depolarizing systems as well. This is possible because the Muller matrix establishes a relation between time-averages intensities of various polarization components of the incident and transformed light beams, rather than between the amplitudes and phases of oscillations. The transmission of light via optical components leads to a change in the state of the four-component Stokes vector: �before → �after. This change can be analytically described using the Muller matrix as 0 ⎡�00 �01 �02 �03⎤ ⎡�before⎤ before⎥ ⎢ ⎥ ⎢ ⎥ . �after = ��before = ⎢�10 �11 �12 �13⎥ ⎢�1 ⎢ �20 �21 �22 �23 � ⎥ ⎦ ⎣ �30 �31 �32 �33 before ⎣ 2 ⎦ � before 3 254 RUDN Journal of MIPh. Vol. 26, No 3, 2018. Pp. 252-260 In the case of an optical system comprising several elements, the Muller matrix of the total system is a product of the matrices of individual components in the order of light transmission. The matrices of elements successively passed by the light beam are written left to right: �after = �� �� 1 . . . � � �before. - 2 1 The elements of the Muller matrix can be calculated using the results of measurements of the Stokes vector components. The problem of reconstruction of the Muller matrix (operator) proceeding from the Stokes vector components measured at the input and output of an optical system belongs to the class of so-called ill-posed problems. 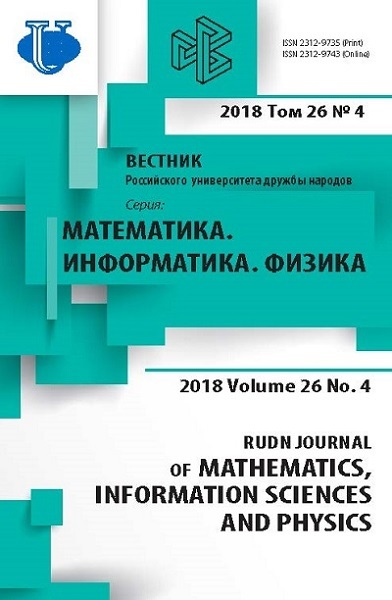 For correctly solving this problem it is necessary not only to perform thorough measurements, but also to use numerical methods of solving ill-posed problems - a special mathematical apparatus developed for the processing of such data . 3. Berreman Matrix Method and Calculation Techniques for Thin Layers There are several approaches to the description of light waves propagating through a layered, in the general case anisotropic medium. These approaches are based on the use of classical models [3, 4], the classical method of Jones’ matrix [4, 5], the extended Jones’ matrix method , and the Berreman’s matrix method . The choice of a particular method is determined by the conditions of application. The extended (4 × 4 matrix) Jones method and the Berreman method are considered universal. The main criteria for selecting a method to be used in our case are the possibility to deal with arbitrary parameters (polarization, angle of incidence) of the input light wave and to take into account multiple reflections at interfaces between layers of an optical system. Both the extended (4 × 4 matrix) Jones method and the Berreman method meet these conditions, but isotropic systems are more conveniently described in terms of the classical methods , which is especially important in solving the inverse problems. For these reasons, the mathematical apparatus and software program are formulated, where possible, so as to use any of the three methods: § the Berreman’s matrix method (below, merely the matrix method), which is applicable to materials of any type and optical system of arbitrary configuration; § the classical method, to be used in the case of isotropic materials and optical systems with no more than two layers; § a combined method, which is convenient for use in the case of two-layer structures on thick isotropic substrates. The main mathematical relationships for an arbitrary incident light wave in the classical description taking into account multiple reflections in oneor two-layer system have been presented above. Below we will concentrate on the matrix method. It should be noted that calculations involved in solution of the direct problems related to the simulation of multilayer structures and devices are more conveniently performed using the matrix method even for simple isotropic materials. This is explained by the fact that the matrix method allows a greater number of parameters of the transmitted and reflected light to be calculated as compared to that involved in simple classical calculations. 4. Matrix Calculation Method Let us consider the method of calculation of the transmitted and reflected light waves, which is based on the matrix approach and developed in [6, 7]. The main idea of this algorithm, which is frequently called the Berreman 4 × 4 matrix method, consists in using the exact transformations of Maxwell’s equations in the matrix form under the condition that the optical medium (layer) is isotropic in the � axis direction. Lovetskiy K. P., Nikolaev N. E., Sevastianov A. L. Optical Characterization of . . . 255 Using the Berreman matrix, which is the matrix of transformation of a linear differential equation, it is possible to take into account the interference effects accompanying multiple reflections between layers in a system studied. Eventually, this matrix determines a linear transformation converting tangential components of the electric and magnetic fields in the light wave at the input of the given optical system into the corresponding components of reflected and transmitted waves at the output. The algorithm under consideration deals with the general case of a refractive index ellipsoid (Fresnel ellipsoid) of arbitrary size and orientation. Let a light beam be incident in the ��� plane at an angle � relative to the � axis. Under these conditions, the tangential components of the electric and magnetic fields of the light wave obey the following matrix relation [6, 7]: ⎛ �� ⎞ ∂ ⎜ �� ⎟ ⎛ �� ⎞ �� ⎜ �� ⎟ ∂� ⎜ �� ⎟ = - � ∆ ⎜ �� ⎟ , (1) ⎝ ⎠ -�� ⎝ ⎠ -�� where �, � are the complex components of the electromagnetic wave, � is the wave frequency, and � is the speed of light. The elements of matrix ∆ are complex quantities and can be expressed using well-known formulas  via components of the permittivity tensor and parameters of the incident wave. If the elements of matrix ∆ are independent of �, a solution of this linear system can be written in terms of the matrix exponent as �(�) = exp (︂��� )︂ ∆ � �(0) ≡ � (�)�(0), (2) � where �(�) = (��, �� , �� , -��) homogeneous optical medium. and � (�) is the Berreman 4 × 4 matrix for the given As can be seen from equation (2), the Berreman matrix of this system has the form of exponent of the matrix. In the general case, calculation of the matrix exponent is a nontrivial task. Berreman suggested to use an approximate formula for the matrix exponent, but this approach is not always convenient and requires great care in selecting the discretization step. However, in the case under consideration, it is possible to develop an effective algorithm for determining the Berreman matrix. Determination of the matrix exponent is based on the calculation of eigenvalues and eigenvectors of matrix ∆, which is achieved using a highly effective algorithm. If all the eigenvalues of ∆ are different, the matrix exponent can be constructed using the Silvester formula 4 ⎛ ∏︀ (∆ - ���) ⎞ � (�) = exp (���∆/�) = ∑︁ ⎜exp (���� ̸ �=� /�) ⎟ , (3) where �� are the eigenvalues of ∆. ⎝ �=1 � ∏︀ (�� - ��) ⎠ �̸=� If the eigenvalues of ∆ coincide, formula (3) is inapplicable. However, in such cases, it is possible to use the Jordan canonical form  that provides for a sufficiently effective solution of the system of differential equations in that case and leads to a required result. The reflection and transmission of light are described using the relations �� = � (�)(�� + ��), (4) where �� = (��, ����, �� , �� �� )� (incident wave vector), 256 RUDN Journal of MIPh. Vol. 26, No 3, 2018. Pp. 252-260 � �� = (��, -����, �� , -�� �� ) � (reflected wave vector), �� = (︀��, �* ��, �� , �*�� )︀ (transmitted wave vector), � � �1 �2 1 �� = cos � � 2 , �� = �1 cos �1, �* = cos � � , �* = �2 cos �2, �1 and �2 are the refractive indices of homogeneous entrance and exit media, and �1 and �2 are the beam angles in the entrance and exit media, respectively. The parameters �� and �� obey Snell’s law �1 sin �1 = �2 sin �2. It should be noted that the above representation of vectors �� , �� , �� is valid only for isotropic media, featuring single-valued relations between the components of electric and magnetic fields. Here and in what follows, the entrance and exit media are assumed to be homogeneous. Solution of the system of equations (4) reduces to solution of a linear algebraic system of two equations with two variables (unfortunately, this system can be degenerate). A solution can be obtained using a regularized stable method, which effectively works for any input parameters. The obtained values of components ��, �� , ��, �� are used as a basis for calculations of the main parameters of the reflected and transmitted light beams, including reflection and transmission coefficients, Stokes vectors, and degrees of depolarization. In particular, the reflection and transmission coefficients are given by the formulas � = �2 cos �2 |��/ cos �2|2 + |�� |2 , � = 2 . |��/ cos �1| + |�� |2 �1 cos �1 |��/ cos �1|2 + |�� |2 2 2 |��/ cos �1| + |�� | 5. Calculations for Thick Layers Unfortunately, the above method encounters difficulties in application to thick layers. Propagation of a wave in a thick layer is accompanied by multiple reflections that result in a phase shift, which is greater than the phase shift corresponding to the coherency of light. However, no such oscillations take place in real systems, where the interference pattern is usually smeared. It is also possible to assume that the accuracy of a measuring instrument (e.g., spectrophotometer) is lower than the period of these oscillations, which results in their averaging in the course of measurements. The transition matrix of a thick (or arbitrary) layer can be calculated using equation (4). For a large layer thickness (relative to the light wavelength), the imaginary component of the argument, exp (����� /�) acquires large values, which leads to significant oscillations in the calculated spectra of both reflection and transmission coefficients. In order to bring the measured data into correspondence with the results of calculations using equation (4), it is necessary to average the latter results. This averaging is performed on a random lattice with respect to the wavelength interval ∆�, as determined by the light coherence length ∆� determined for spectrophotometers using the relation ∆� = �2/∆�. 6. Combined Calculation Method In solving the inverse problem for determining the parameters of an anisotropic layer on a thick isotropic substrate, it is convenient to use a combined method, whereby the transmission of the anisotropic layer is described using the matrix technique and the substrate properties are calculated in terms of the classical method. It should be noted Lovetskiy K. P., Nikolaev N. E., Sevastianov A. L. Optical Characterization of . . . 257 that this approach can be used only for the calculation of transmitted and reflected light intensities. However, these very variables are measured by spectrophotometry and serve as the input data for the inverse problem in the case under consideration. Figure 1 illustrates the scheme of calculations according to the combined method. Here, �¯02 is the total energy of the primary wave transmitted from the entrance medium (medium #0) to substrate (medium #2), �¯01 is the total energy of the primary wave reflected from the first (between layers #0 and #1) interface, �¯20 is the energy of the wave reflected from the second (between layers #2 and #3) interface and transmitted back to the entrance medium, and �¯21 is the total energy of the wave reflected from the 2/1 interface, with allowance for the multiple reflection of light in the thin film layer. + E0 0 α R01 T20 entrance medium (air) n0 TCF T02 R21 R23 T23 thick substrate N2 = n2ik2 exit medium (air) n3 Figure 1. Propagation of an electromagnetic wave through a two-layer system By using the proposed combined method, it is possible to significantly reduce the time required for solving the inverse problem. Methods described above serve a basis for calculations of the light transmission and reflection in the direct and inverse optical problems. 7. Conclusion The main input parameters of a light wave are the intensity, the polarization, and the angle of incidence. The main optical characteristics of materials in both direct and inverse problems are the permittivity tensor and the thickness � of a given material. The main output optical properties of a system in the direct (simulation of optical behavior of multilayer stack) problem are the transmission and reflection of light intensity for the light of different wave lengths and incident at various angles. In the inverse problem, these characteristics are usually considered as the initial data. In the direct problem, additional output characteristics (calculated from the values of transmission and reflection) can be the Stokes vectors of the transmitted and reflected light, the degree of polarization, phase shifts, contrast ratio, efficiency, color coordinates, color rendering, and some others. It should be noted that the process of determination of the material parameters from measured data (inverse problem solution) involves multiply repeated solution of the direct problem, which is necessary for selecting the unknown values of permittivities. For this reason, effective solution of the direct problem plays a key role in the entire mathematical formalism and software. Another important circumstance is that the thicknesses of films are frequently known only approximately. However, even very small variations of the film thickness (within 2-10 nm) may lead to significant changes in the interference pattern for both transmission and reflection of light. Therefore exact determination of the film thickness is very important (and also is an unknown parameter) in solving the inverse problem. A. V. Tikhonravov, M. K. Trubetskov, T. V. Amotchkina, “Optical Monitoring Strategies for Optical Coating Manufacturing”, Chapter 3, Elsevier, 2018. doi: 10.1016/B978-0-08-102073-9.00003-5. A. Tikhonov, V. Arsenin, “About Solution of Degenerate and Ill-Posed Linear Algebraic Equations”, Chapter 3, Winston and Sons, 1977. M. Born, E. Wolf, “Basic Properties of the Electromagnetic Fields” and “Elements of the Theory of Interference and Interferometers”, Chap. 1 and Chap. 7, 5th Edition, Pergamon Press, NY, 1975. R. M. A. Azzam, N. M. Bashara, “Propagation of Polarized Light Through Polarizing Optical Systems” and “Reflection and Transmission of Polarized Light by Stratified Planar Structures”, Chap. 2 and Chap. 4, Elsevier, Amsterdam, 1977. P. Yeh, C. Gu, “Electromagnetic Propagation in Anisotropic Media”, “Jones Matrix Method” and ”Extended Jones Matrix Method”, Chap. 3, Chap. 4 and Chap. 8, John Wiley & Sons Inc., 1999. D. W. Berreman, Optics in Stratified and Anisotropic Media: 4 × 4-Matrix Formulation, J. Opt. Soc. Amer. 62 (4) (1972) 502-510. S. P. Palto, An Algorithm for Solving the Optical Problem for Stratified Anisotropic Media, JETP 92 (4) (2001) 552-560. R. Bellman, Introduction to Matrix Analysis, 2nd Edition, Soc. for Industrial and Applied Math., Philadelphia, PA, USA, 1997. Copyright (c) 2018 Lovetskiy K.P., Nikolaev N.E., Sevastianov A.L.